← Health: Can Being Too Clean Hurt Your Baby? I found this large, 5-year study conducted with Chinese people very gratifying. It showed that poor nutrition is definitely associated with the development of multiple chronic diseases, also referred to as multimorbidity, over time. We all know habits like smoking, being overweight, not exercising increase your risk. But even though I have been talking about the importance of nutrition for a long time, this is the first long-term study of its kind to show the link to nutrition. That’s very exciting to me because it is one more factor we can control. The study focused on fruits, vegetables and whole grains as well as highlighting the role of micronutrients in protecting against disease. Personally, I do still recommend people limit the amount of grains of any kind that they eat. And when they talk about healthy whole grains they are referring to grains that have not been processed – so that eliminates anything made with flour, even if it’s a “healthy” flour. Processed is still processed. I happen to be a big fan of “grains” like quinoa, millet, brown, black, green and red rice, buckwheat, barley and steel cut oats but I still recommend limiting your intake. I prefer to make my primary carbohydrate intake come from vegetables most days of the week – particularly leafy greens. I think it is wonderful news that this study has brought this important fact to light because so many people seem to have multiple health problems. They go on meds and then find there is a second chronic problem. So they go on more meds and may have a third problem develop as a side effect of one of the medications. And on and on it goes and they don’t think their food is a powerful ally in combating chronic illness. But it is and I’m happy this study bore that out. 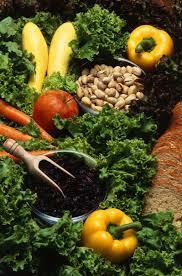 Do you consider nutrition to be powerful preventive medicine? Want to see more articles like this? Subscribe to this blog (just click on “Follow”) and get each new post delivered to your email or feed reader. If you find improving your diet to be complicated – it doesn’t have to be! I offer free evaluations as well as my popular 3 Day Diet Makeover. I would love to help you improve your diet and your health! This entry was posted in Cancer, Diabetes, Heart Health, Nutrition and tagged chronic illness, diet, food, fruit, health, nutrition, vegetables, whole grains. Bookmark the permalink. Ann – I learned this through my own experience of medical issues. I changed my diet and today only take supplements for my health. No medications. Yay!! Thanks for all you do. Jenny that is truly awesome! Good for you! “An ounce of prevention is worth a pound of cure.” What a great way to prevent illness. Thanks for keeping us informed. Thank you Deb – I always appreciate your comments. Ann, great post. Being in emergency medicine for over 14 years I can completely agree that lack of proper nutrition causes many issues. In the 12+ years I was on an ambulance alone, I can tell you that food has a huge thing to do with health. I do not think we realize the impact our eating can truly make until we become intentional with it. Now working for a group of cardiologists I see daily the way eating can make or break you. Keep up the good fight and thanks for helping get the much needed info out there! Great job! Chris I thank you so much for your comments. They mean that much more since you are a health professional and see first hand how important nutrition is. I totally agree with you that nutrition is important to our health and God gave us food to eat for nourishing our bodies and made it tasty for our pleasure. I’m sure we could all benefit from better nutrition! Yes – He gave us delicious, real foods that will nourish us and that we derive pleasure from! A win-win! !